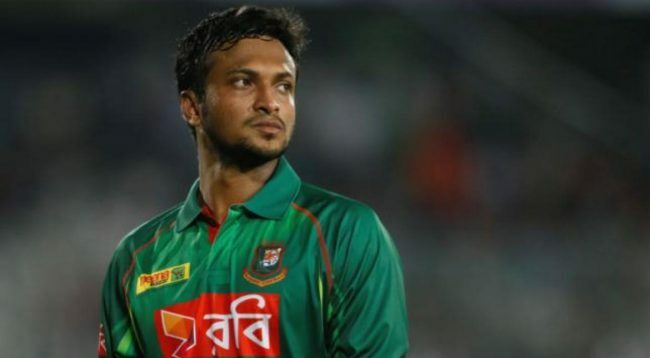 Hossen Sohel: Bangladesh all-rounder Sakib al Hasan yesterday said he might undergo surgery in his injured finger before the Asia Cup in UAE that would effectively rule out him out from the tournament. ‘We all know I have to undergo surgery. The discussion is now on with physio about when and where it should be done better. But I feel that the earlier it is possible the better, most probably before the Asia Cup,’ Sakib told reporters at Hazrat Shahjalal International Airport upon team’s arrival from West Indies, reports New Age. Sakib played with painkiller during the recent one-day international and Twenty20 series in West Indies, which Bangladesh won both by 2-1 margin. Sakib hurt the base of his little finger in the left hand while fielding during a tri-series ODI tournament against Sri Lanka on January 27 and missed the two-match Test series and both the Twenty20 Internationals in the following weeks against the same opponents. He returned to the team with the Nidahas Trophy in Sri Lanka but always carried some pain. During his healing period the physicians in Australia advised him to undergo surgery for a complete recovery from the injury. Bangladesh have been drawn in poll B with Sri Lanka and Afghanistan in the Asia Cup, scheduled from September 15 to 28.